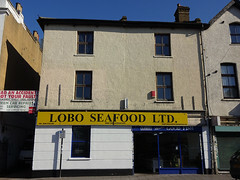 Possibly also called "Lobo Fisheries" or "Lobo Fisheries (Billingsgate)" — the signage on the front (as of January 2012 at least) is contradictory. Most of the fish is frozen, though they do have a few fresh fish sold by the box (e.g. mackerel at £22/box, March 2012). There's a good selection of all kinds of fish and seafood, including whelks, mussels, squid, and octopus. Some prices as of March 2012: £5 for 1kg cooked peeled tiger prawns, £5 for 750g raw squid rings. Accessibility: No step to get in, and there's a fair bit of room to move around inside. Existence last checked in December 2018. Last edited 2019-02-16 17:33:00 (version 23; diff). List all versions. Page last edited 2019-02-16 17:33:00 (version 23).